Tuning Up the Lawn Mower - DIY or Repair Shop? 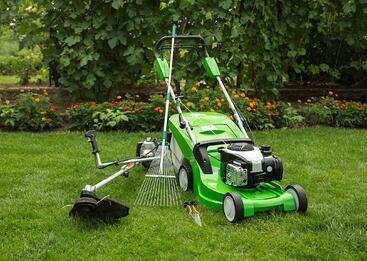 Have you noticed that your lawn mower isn't running as smoothly as you'd like since you've fired it up this season? A lawn mower tune up is a fairly straight-forward task, taking no more than an hour or two, at a cost of around $30 - for a new air filter, spark plug, motor oil, and professional blade sharpening at a repair shop. The going rate for a repair shop to do the same tune-up? Between $50-75. Not surprising - it’s cheaper to do it yourself - but you also need to factor in the time it takes to do the work and to gather tools and buy parts. If you're ready to tackle the job, we'll go over the basics here. For detailed, in depth instructions, [with pictures!] Angie's List has a fantastic resource, here. Remove the spark plug. This will prevent the mower from accidentally starting. Since you will have your hands near the mower blades, this is an important first step! Drain the engine oil. Refer to your mower's owners manual for specific instructions on the process for your mower. Yours may have a drain plug, or you may have to tip the mower. If you don't have a manual, you can look up the model online, and download a copy. Replace the air filter. Remove filter cover, and replace filter, pleat side facing out. Change the spark plug. Loosen with a spark plug wrench, then remove by hand. Insert and tighten new spark plug by hand, then give one more turn with spark plug wrench, taking care not to damage porcelain tip by turning too hard. Sharpen Blades. You can sharpen the blades yourself, with a file or bench grinder, or take it to a repair shop and let the pros sharpen it. Either way, you'll still have to remove the blades. Tilt the mower on its side and use locking pliers to prevent the blade from slipping. Then, use a socket wrench to unscrew the bolt that holds the blade in place. Wear a pair of work gloves to prevent cutting your hand while touching the blade. Replace oil. Make sure you've replaced the drain plug, if there was one. Use a funnel, and check the level periodically as you pour. Reconnect the spark plug wire. Do this only after you've successfully completed the previous steps, and you are ready to start the mower. Noticing too many weeds in your yard while you're mowing? Give the pros a call and let us help! Contact us here or click below to see the affordable packages we offer.